A bright, attractive smile can say a lot about a person. Dr. Lurie offers cosmetic dentistry services at his East Brunswick, NJ dental practice to ensure that patients can achieve the smile they have always wanted. Contact us today to learn how we can touch-up or transform smiles with cosmetic dentistry. Teeth stain during our lifetime due to consumption of a variety of foods and drinks (soda, coffee, tea, red wine, spicy food…). The new technology of teeth whitening has enabled dentists to whiten teeth without any change or damage to the tooth structure. 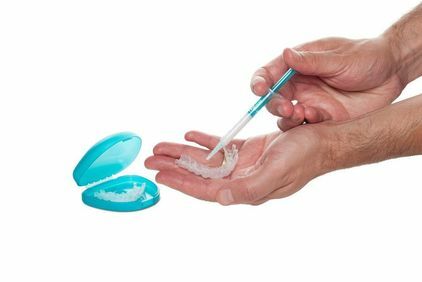 Almost all the whitening methods are similar in concept but some are much more effective because of the way the whitening material is delivered to the teeth. The other factor in effectiveness of the method is the concentration of material, which is the reason why over the counter whitening systems usually don’t give patients the result they are hoping for. The two main methods of professional whitening are tray whitening and in-office whitening. Tray whitening is when a custom tray is fabricated for the patient after an impression is taken. Afterwards, a supply of whitening gel is given to the patient. This gel can be placed into the tray which can then be worn for a certain period of time each day or night until the supply of gel is completely finished or the desired appearance is achieved. 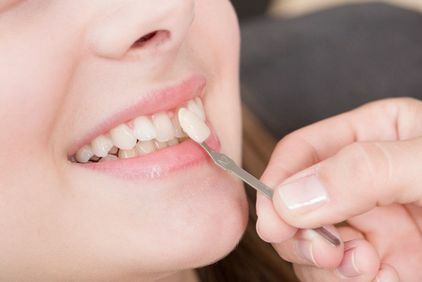 Tray whitening is considered to be the best "long-term" way to maintain your improved smile since the touch-up kits you can purchase are relatively inexpensive and they can be used as often as you see fit. In-office whitening, on the other hand, is the most effective method of whitening. By using the GLO Science Technique of bleaching, our office treats your teeth to a system that combines both the quick results of the in-office technique along with the long-term benefits of a take-home system. This way your teeth are whitened immediately and you get to keep that new color for years to come. There are advantages and disadvantages to all of the bleaching methods we incorporate into our practice, and we can give patients more detailed information as to which technique best fits their needs. This is how patients can get a beautiful smile quickly. Veneers or laminates are a thin shell of porcelain or resin that is bonded to the surface of the teeth to change their shape, shade and position to improve the cosmetics of the teeth and smile and/or replace and restore the lost tooth structure where it is indicated. Dr. Lurie will do a complete examination of the teeth and will determine if veneers are appropriate. Usually with veneers it is possible to improve the esthetics of the teeth and smile dramatically. Veneers can improve the shape of the teeth, make the teeth as white as possible, and give patients the smile they have always wanted. Veneers are bonded to the tooth structure, which gives them strength. Also because they are very thin, they are considered one of the most conservative cosmetic treatments available. Most of the time very little tooth structure is removed before placing veneers. Ask Dr. Lurie how veneers can improve a smile. Dr. Lurie strives to provide comprehensive care in a welcoming environment which puts patient satisfaction first. Reach out today to take advantage of our transformative cosmetic dentistry services.